A SpaceX Falcon 9 rocket streaks toward space from Florida's Cape Canaveral Air Force Station in this spectacular long-exposure view of the company's successful Dragon cargo ship launch toward the International Space Station for NASA on Sept. 21, 2014. The private spaceflight company SpaceX lit up the night sky over Florida early Sunday (Sept. 21) with the spectacular launch of a Dragon spacecraft packed with supplies — including the first 3D printer in space and a troop of 20 mice — for the International Space Station. 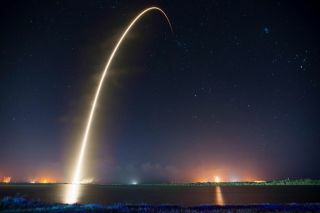 The unmanned Dragon space capsule launched into orbit atop a SpaceX Falcon 9 rocket from Cape Canaveral Air Force Station in Florida at 1:52 a.m. EDT (0552 GMT). Ten minutes later, Dragon reached orbit and separated from the Falcon 9. It should reach the space station on Tuesday, Sept. 23. "It was a beautiful night," Scimemi said. The SpaceX-4 mission to the ISS will carry aboard some unusual items. See how mice, 3d printers and more are riding into orbit in this Space.com infographic. Dragon is also hauling the first space-grade 3D printer, built by Made in Space, which will test whether the on-the-spot manufacturing technology is viable without gravity. "If we're really going to set up shop on Mars, we have to get there," Sheehy told reports during a briefing Friday morning. "We really can't afford to bring everything we need." "They move to the bottom of the cage and they hang tight until the ride is over," said Ruth Globus, a project scientist for the new rodent habitat at Ames Research Center in Moffett Field, California. After launch, SpaceX performed a reusability test with the first stage of its Falcon 9 rocket. After separation, the booster reignited out over the Atlantic Ocean and went through a couple burns to bring it down into the water gently. SpaceX officials said they didn't expect to recover the first stage nor did they anticipate they would be able to see much of the nighttime test. SpaceX's goal had been to recover a Falcon 9 first stage with a touchdown on land by the end of 2014. But Koenigsmann said that type of demonstration was unlikely to happen during the next mission. "We're working actively with range safety to make this safe and also reliable in terms of public safety," Koenigsmann told reporters Friday. SpaceX founder and CEO Elon Musk has long-term ambitions to develop a fully reusable rocket will lower the cost of launching vehicles into space — and eventually enable travel to Mars. If all goes according to plan, Dragon will perform a series of carefully timed thruster firings to catch up to the space station on the morning of Tuesday (Sept. 23). Astronauts will use the space station's robotic arm to grab Dragon and attach it to a docking port. Dragon will spend about four weeks at the space lab to allow astronauts to unload the new cargo and refill the capsule with about 3,800 lbs. (1,723 kg) experiments and other equipment to be returned to Earth. Orbital Sciences is the only other private American company besides SpaceX that NASA has hired to fly unmanned resupply missions to the space station. The Dulles, Virginia-based company has a $1.9-billion contract to fly eight missions total using its own Cygnus spacecraft and Antares rockets. Orbital Sciences launched its second official delivery flight to the space station in July, with its next mission set for October. Unlike Orbital Sciences' disposable spacecraft, which burn up in Earth's atmosphere at the end of their mission, Dragon has a heat shield that protects it from the brutal re-entry. About five and a half hours after Dragon leaves the space station in mid-October, it will deploy its parachutes and splash down off the coast of Baja California. A recovery boat will scoop the capsule out of the Pacific Ocean. Eventually, SpaceX also wants its Dragon capsules to make soft landings on the ground. Just this week, the Hawthorne, California-based spaceflight company was hired to help keep the space station fully staffed as well. SpaceX won $2.6 billion of NASA's Commercial Crew Transportation Capability award to launch American astronauts to the space station from U.S. soil by 2017 using a modified, manned version of Dragon. NASA, which announced the deal Tuesday (Sept. 16), gave Boeing a $4.2 billion slice of the award to provide the same space-taxi service with its CST-100 capsule. The United States lost the capability to send its own astronauts into space when NASA retired the space shuttle program in 2011. "This is kind of a crazy busy week for us here at NASA," Ellen Stofan, NASA's chief scientist, told reporters Friday (Sept. 19). In addition to the commercial crew announcement and the SpaceX launch, NASA is also expecting its Mars-bound spacecraft MAVEN to enter orbit around the Red Planet late Sunday night. Visit Space.com Tuesday for live coverage of Dragon's docking at the space station.